We are People First, a fun and motivated group of self-advocates with intellectual and developmental disabilities who meet in Jefferson County to support each other and to help each other become better advocates and leaders. People First is the local chapter of Speaking For Ourselves - Colorado, which is the statewide organization. 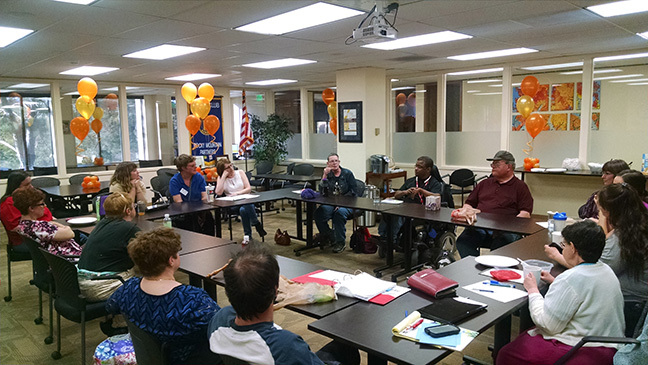 Below is a photo from our most recent People First meeting (these happen on the first Wednesday of every month from 6:00 - 7:30 at The Arc's office). Want to learn more or join our group? Call 303-232-1338 and ask for David or Valerie, or send an email to david@arcjc.org or valerie@arcjc.org.